Pitting farmers and food security against industry jobs, heritage against so-called clean energy, the proposed Site C dam may become British Columbia’s most costly environmental battle. Beekeeper Guy Armitage. Much of his Hudson’s Hope Honey farmland and bee habitat will disappear under the Site C reservoir. hand, firmly refusing to sell. Now it’s Groundhog Day: Hydro again wants the Boons out, and they again refuse to leave. Despite the agricultural wealth of large valleys like the Cowichan, Pemberton, Fraser, Okanagan and Columbia, British Columbia imports 70 per cent of its fruits and vegetables from California. But as droughts, depleting aquifers and changing climate increasingly disrupt this food supply, many rightly question the wisdom behind flooding a valley full of prime farmland for electricity that a consensus of experts holds can’t be rationalized. Ross Peck fishes on the Peace River in front of his farm. Ross raises horses and grows wheat and canola on land that will be flooded by Site C.
Ironically, the same shifting climate patterns wreaking havoc on California’s agriculture industry have been beneficial for the Peace—earlier springs and warmer temperatures have joined long, northern summer to produce bountiful crops on the most productive farmland in the province’s north. Arlene Boon’s grandfather was one of the earliest to farm the valley’s rich river soils, homesteading here in the early 1900s. Today, the Boons continue to cultivate grain while leasing out property for fruit and vegetable crops. This indeed seems a shame when you consider that the reservoir expected to pool behind the Site C dam will flood some 5,500 hectares—including over 3,200 hectares of top-quality Class 1 and Class 2 soils in Crown and private holdings. That would be the largest ever removal of farmland from B.C.’s Agricultural Land Reserve (ALR), established in 1973—ironically—to protect the province’s most productive farmland from development and urbanization. Recently, however, the province severely eroded the powers associated with the ALR through Bill 24, which serves to open previously reserved land to development in the resource-rich north and southeast parts of the province. Critics point to this bill—and Site C in particular, the ugly stepchild of a helium-filled dream for a provincial liquified natural gas (LNG) industry—as evidence of the government’s continuing short-sighted pursuit of profits from boom/bust resource extraction. But undermining its own food-growing capacity isn’t the government’s only recidivist act when it comes to Site C.
Whether Site C goes ahead or not, the Peace River already has a damning history of dams. In 1968, BC Hydro finished its seven-year construction of Site A, aka the WAC Bennett Dam and Williston Reservoir, North America’s largest artificial lake at 250 km x 150 km. Then, in 1980, the utility completed Site B, the Peace Canyon Dam, and its 21-kilometre reservoir known as Dinosaur Lake for the important fossils and footprints lost forever beneath it. While some B.C. residents might feel constructing a third dam on the already impacted Peace is better than damming a virgin river elsewhere, local indigenous peoples beg to differ. Chief Roland Wilson of the West Moberly First Nations knows all too well the effect of large-scale dams on his people’s traditional territory. His mother, Betty Wilson, was caught off guard when the waters of Williston Lake began to rise. Given no notice the dam was coming, she’d watched helplessly as cabins, traditional transportation trails, and sites of spiritual and cultural importance were washed away. It wasn’t until June 2016 that BC Hydro officially apologized for this atrocity, but it’s now poised to commit the same crime—this time with prior notice. Site C threatens unmarked First Nations’ graves and heritage sites, and, since the project began, it is felt that due process on consultation, and archeological and cultural concerns, have been largely pushed aside. Ken and Arlene Boon enjoy a day out on a section of their farm that would be flooded by the Site C reservoir. The Treaty 8 First Nations collective is fighting Site C with both provincial and federal court cases claiming that the decision to authorize the project by the Canadian and BC Environmental Assessment Agencies’ Joint Review Panel overrides treaty rights and threatens traditional ways of life on un-ceded lands. Despite authorizing the project, the Panel stated that it would indeed have adverse effects on hunting, fishing, and traditional land use by First Nations. While B.C. politicians try to get the dam to “the point of no return” in the face of pending court challenges, construction continues in November 2015. In order to foster such a relationship—and with Raybould, now Federal Minister of Justice, speaking out at the General Assembly of the United Nations on the topic of the Declaration on the Rights of Indigenous Peoples—it is incumbent that the Trudeau government directly address the concerns of Indigenous peoples affected by major developments like Site C.
Erecting massive dams has proven disastrous to the ecology of the Peace River, submerging both floodplain and islands that once provided crucial year-round habitat for moose, deer, elk, bison, rare songbirds, waterfowl, muskrat and other wildlife. Prior to construction of the WAC Bennett Dam, the West Moberly First Nation were able to sustainably harvest caribou from the Klinse-Za herd. But the enormous Williston Reservoir prevented historic east-west caribou migrations, leading to a population collapse and ending the hunt in the 1970s. With recent increases in oil and gas development on the land, caribou numbers have further declined to where, in a last ditch effort to preserve their traditional food source, the West Moberly now support controversial government-sanctioned wolf culls. More of the same can be expected with Site C.
In terms of aquatic life, BC Hydro claims to have learned from past mistakes. In a story for environmental watchdog DeSmog Canada, journalist Sarah Cox outlines Hydro’s nifty, 100-year, $25.5 million “trap and haul” plan to aid fish blocked from reaching upstream spawning grounds by the Site C dam: the process involves capturing fish—including British Columbia bull trout and three additional at-risk species—in man-made fish-ladders, then driving them around the dam in trucks. Horses on the Ardill family ranch. Although it is required by law to help the 32 fish species that will be affected by Site C to reach their spawning grounds, there’s a significant problem with Hydro’s plan—it likely won’t work. Unlike salmon, for instance, bull trout seem averse to any man-made structure. Cox’s research found that the only bull trout ladder in North America, on the Clark Fork River in Idaho/Montana, has proved an exercise in futility. Of the reported 25,000 fish that used the structure in 2011, only 12 were bull trout; in 2015, that number dipped to just seven, five of which turned back halfway—and the Clark Fork ladder is less than half the length of that proposed for Site C. Other concerns include fish deaths in dam turbines (as many as 40 per cent of large fish passing downstream according to Hydro’s own Technical Data Report) and inevitable contamination due to methylmercury, formed naturally by bacteria feeding on carbon in flooded vegetation and soil. The Joint Review Panel stated that mercury levels would be so high that Site C reservoir fish could be inedible for 20–30 years. On a positive note, fish that do make it up the ladder will ride in the best trucks 26 million tax dollars can buy; no word on whether they’ll get snacks and entertainment en route. The most tragic part of the Site C saga may be that British Columbians don’t need the power the dam is going to create. In Disturbing the Peace: The Story of the Site C Dam, a video released in June 2016 by DeSmog Canada, Harry Swain, Associate Fellow at the Centre for Global Studies at the University of Victoria, calls the dam a very expensive mistake. “There is no need for Site C,” he says. “If there was a need we could meet it with a variety of other renewable and smaller-scale sources. Of the $9 billion it will cost, at least $7 billion will never be returned.” Swain is no environmental Svengali—he actually chaired the Site C Joint Review Panel. And he’s not the only credentialed spokesperson casting doubt on Hydro’s math or highlighting its prevarication skills. As intially reported by Cox/DesSmog, in a 2015 Supreme Court affidavit addressing an injunction the utility sought to block protesters, it was former BC Hydro CEO, Marc Eliesen himself who destroyed its absurd claim that a one-year delay in construction would add $420 million to the bill, calling this “effectively illusionary” and based on “fundamentally flawed” analysis. Chief Roland Wilson stands beside the Peace River near Hudson’s Hope. In the same DeSmog article, Eliesen—who has also headed both Ontario’s and Manitoba’s electricity authorities—found BC Hydro’s testimony “fails to provide the proper and comprehensive historical context” and is “without merit.” He also stated that proceeding with Site C was, at the moment, “highly imprudent,” noting that delaying construction would actually save provincial ratepayers more than Hydro’s alleged costs given its own projections for decreasing demand for electricity—particularly among heavy users like the pulp and paper sector. Putting values to this, American energy economist Robert McCullough calculated that, based on Site C power being sold at a loss due to the dramatic fall in world energy prices since 2008, a delay of one-year would save ratepayers $268 million, of two-years, $519 million, and of five-years, some $1.18 billion. Though even a casual observer can see that the numbers don’t add up, both the province and publically owned BC Hydro seem committed to ramming Site C down taxpayers’ throats, claiming it’s in their best interest. Yet history suggests neither party can be trusted to have any interests at heart but those of the resource-extraction industries keeping them in power (and yes, that’s a double-entendre). In 1980, Hydro released a 20-year consumption forecast that has proved to be incredibly exaggerated—the kind of projection expected if a six-year-old was overseeing production at a candy factory. More recent consumption estimates—those currently being used to bamboozle the province’s citizenry—also miss the mark. The reality is that British Columbia’s energy demand has levelled off in the last decade and even decreased slightly since 2007. With consumers using less energy, B.C.’s Liberal government, headed by Christy Clark, finds itself grasping at straws to justify the province’s most expensive public project ever. On the heels of falling gas prices and huge opposition, Clark’s election-promised and much ballyhooed liquefied natural gas (LNG) export industry hasn’t materialized to sign up for Site C power (good news for the environment, as extracting LNG from the ground is like fixing a plugged toilet by dropping dynamite into the bowl). Further plans to sell electricity to Alberta (likely in exchange for an oil pipeline to the Pacific) seem unlikely to materialize at any price point that makes sense for B.C. With cheaper power available from American dams on the Columbia River and smaller run-of-river projects around the province, plus the growing shift to renewables like wind, solar and geothermal (an enormous, untapped resource in B.C. ), megadams like Site C seem anachronistic. In neighbouring Washington State, they’re dismantling such structures and undertaking ecological restoration of the river system, following scientific consensus that big dams are not the way of the future. If so, why are excavators already digging up the Peace’s riverbed, bypassing normal environmental safeguards under the guise of a “Clean Energy Act” while indigenous rights, environmental concerns, and common sense are swept under the rug? Why, when 250 top scientists and scholars pen a letter to the Prime Minister urging that this misguided project be stopped because its significant environmental effects are unprecedented in the history of environmental assessment in Canada, is it instead fast-tracked by a province bent on getting it, as Christy Clark famously stated, “to the point of no return”? Political hubris plays a role—it’s difficult to admit to a mistake when your salary and ego hinge on the perception that you’re getting things done in the public interest. But the facts, the science, and objective common sense all point to the same conclusion: Site C is a bad idea that the people of B.C. will be paying for, both monetarily and otherwise, into perpetuity. And while Indigenous peoples and Peace River farmers fight as hard as they can through lawsuits and with media coverage of large protests like the annual Paddle for the Peace armada that has taken to the river every July since 2005, most agree Site C will only be defeated from above. Dustin Perry is a Squamish, B.C-based geologist, hunter and fisherman who has often driven through the Peace River Valley en route to the north. Working in the mineral-exploration sector and being familiar with the regular permitting and environmental assessment process for mining, he remains amazed at the lack of regulation for the Site C project. 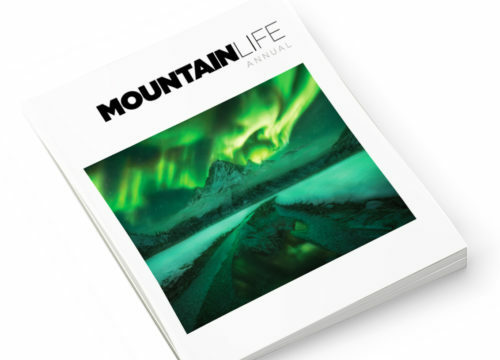 Subscribe to Mountain Life Annual today and support meaningful, reader-driven journalism. MLA is a manifestation of the collector’s, coffee table approach to top-notch print that combines photography and adventure journalism into one unified publication. Buy a copy for yourself, give it to an old friend and save 25% off of each premium-quality edition. We are Canada’s outside voice. We’d love you to be part of it.